DunGen has been around awhile now. The theming tags are a success in making the kind of rooms & monsters used make sense together when applied, but the random placement is still lacking for what I'd like it to be. I think they need at least one more level of tagging that would help organize usage, maybe "inner" versus "outer" for each room label, and a clumping algorithm that tends to make rooms from the same theme clump together adjacently more often, with "outer" room labels being used more around the edges of clumps and inner labels more where they don't border labels from other themes. Still make it all biases and not absolute so there can be serendipitous adjacencies to spice things up. Then do something that creates explicit bosses and groups them and the bigger treasures more in "inner" rooms. Entrances could be made explicit, and be "outer" rooms. I'll need to think about algorithms to get this effect. I'd also like some sort of explicit locks and keys mechanism where some rooms have elements that are made accessible by bringing some item from another room. I'd like to have something of the vibe of the computer game "Unexplored" in that feature. Another pass through adding an attribute to every label doesn't sound like much fun to do, but I think it might be worth it for this effect. It probably would be a good idea to clump creature types somewhat as well. So maybe the room count is established, then the graph gets linked up. Then instead of the random rolls for each room, roll up separate lists of room labels, retaining the whole object for each, and a list of monsters (or blanks) and traps (or blanks) and quirks (or blanks) and hooks (or blanks). Sort the lists by monster theme tags and level total, or room theme and inner or outer. Then draw off of these as decks, starting by placing the entrance and several edges away the boss room or boss rooms, which should also be spread apart if of different factions. Then deal out inner room labels in rooms adjacent to boss rooms and outer labels for the entrance and adjacent rooms, and then remaining inner rooms around similar theme inner rooms and outers to fill in the gaps. Some sort of shuffle and draw might place creatures, traps etc, as objects, only rendering out to strings at the end, so the final result is editable by the DM using the tool. 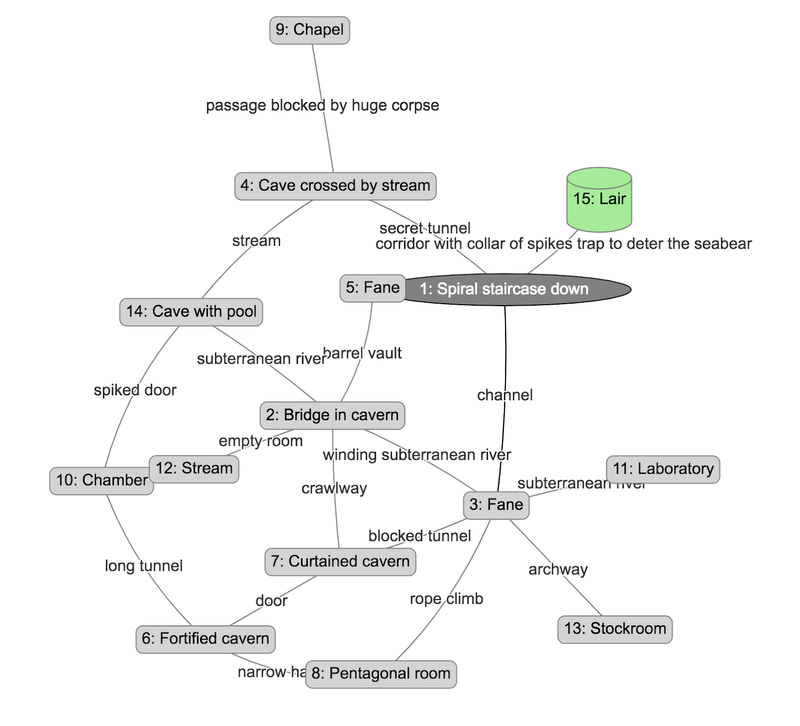 This is still more ideas than implementation, but I think something along these lines could move DunGen the next step along towards making coherent, useful procedurally generated dungeons with less tweaking needed between generation and worthwhile playability. It's concrete enough for me to start thinking more clearly about implementing it. Another, back of the mind thing I've been thinking about is doing classic multi-level dungeons, from midi to mega size, with built in side views, themes for different levels, and linking entrances/exits that jump you from one level map to another. This would probably make more sense to do after a rebuild along the lines above, but keeping it in mind, while working up what goes into a level. The cleric's Turn Undead effect in OD&D is an awfully binary affair. Even in the rolled range, the result is T or nothing. Some drama could be added by having a close miss on the roll have partial effect. Here's a possible rule: A turn roll missed by one or two points give the effect W, Warded. The cleric's holy power is having some effect on the undead but it is still contested. While the Warded condition is in effect, undead attacks that just do conventional damage have it halved, round up and undead attacks that do drains have it downgraded to dice of damage. A shadow's strength drain or a wight's single level of life drain becomes a die of damage, a spectre's two level drain adds two dice of damage while warded. So there is still a fight on, but the party is protected temporarily from the scariest effect of powerful undead, their life drain. The warding effect emanates in a 30' radius around the cleric. So, how long does warding last? That depends on how strong you want it to be and how much mechanics are worth keeping track of. The simplest answer is one combat round. Next might be 1D6 rounds, or a round plus at the cleric's next action, there is a new roll, that either resolves the condition or continues the ward. There could be rolls against WIS or CHA to maintain concentration each round, or when damaged by an undead, or other finer grained mechanics. I think I would go with this: the cleric can maintain the ward until choosing to reroll for resolution or damaged by one of the warded undead. While maintaining the ward, the cleric can attack but not cast spells. This is an example of starting from a run of DunGen, and digging in and editing the results until a usable scenario emerged. 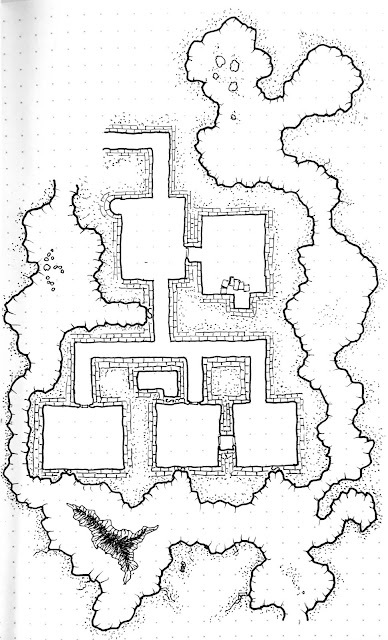 It was a basic run, so makes a midsize, unthemed dungeon for a low level party, approximately 1st-3rd in OD&D. I put in about an hour and a half making edits and figuring out what it is about. And another hour and a half making it into the blog post and revising some more. I relabeled edges, added more description & elements to rooms, moved some linking edges, customized the entrance rooms on the map to make them stand out, tweaked names, moved some items to rooms they fit better, renamed monsters, etc, to adjust it from being a hodgepodge to what it is now. Most of the spiderkin started out as "spiders" but when I looked at it, they needed sentient agency, so the spiderkin were born. Zozer and his religion started out by rationalizing and expanding on some vague hooks. The hooks got religious themed because the preponderance of random rooms that weren't caverns happened to be religious theme rooms. On the tip of a peninsula stands the crumbling ruin of a lighthouse and in the caverns beneath, an ancient temple of the god Zozer who traveled the sky in his skyship. 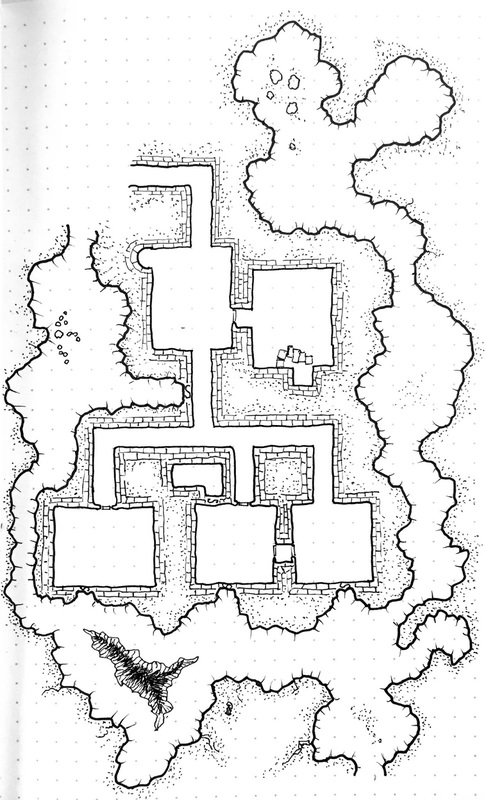 The temple is desecrated and overtaken by a Spiderkin cult (think lesser ettercaps, mostly level 1, led by a mad science inclined wizard). Some unlucky mushroom men got captured by the Spiderkin and a few who escaped and are trying to get out completely are on the wandering monster table. They might talk the PCs into rescuing their comrades from the wicked experiments of Vvixx. There are a couple of ways here to draw Zozer's attention and one way to make a distant magical travel to another place for a sequel scenario. projecting from the wall, just inside the darkness at the head of the stairs. An incautious person might stumble and fall when stepping onto the first stair in the dark or fall if out into the open space in the middle. The drop is 30 feet. A ghostly scene of priests boarding a ship that flies into the sky plays out and repeats hourly. and an empty oil lamp on another. in the basin and sacred oil lit in the lamp. Empty, but for a broken basin and ugly marking scratched into the walls. There is are niches that used to hold oil lamps near head height on the walls. are around and some under, the fallen part of the stone basin. stripped of 4 sacred gemstones. If activated by their replacement, it will heal, cure of conditions, and emit a 30' radius Protection from Evil aura. This will also draw the attention of the diminished god of the Sky Ark, Zozer. would be very valuable sold to nobles or rich merchants. 200 GP is the maximum value they might sell for. with two more horrified mushroom men in a cage. Vvixx wears the Ring of Protection +1, with a crown shaped like a winged golden ship. The pillar remains from previous use as a temple. a place of holy power, now desecrated and occupied by unholy enemies. 15: Lair A crumbled lighthouse tower. It shows signs of a sea bear having laired here. The sea bear is out on a hunt and won't be back for 4D12 hours. A corridor leads away into the remains of the curtain wall. Possible hook: The wizard Whaltis hired the party to retrieve the Ring of Protection from Zozer Caverns. Basic spiderkin are 1HD, look like a cross between people and spiders, and have chitinous hide equivalent to leather armor. The spiderkin have a poisonous bite they can employ in the round following a successful grapple. Each spiderkin can use this bite once per day. Henoxcross, population: 41, middling, half a day's sail to the northwest. Dark Jarfer, population: 126, wealthy, four days walk to the southeast. Chael, population: 50, middling, two days sail to the southwest. One thing that bothered me a bit is how much of a grab bag each group of NPCs was, with a completely random selection there was no implied story there. So now there is an experiment towards remedying that. Here's what I put in this morning. When generating a group of NPCs, build a virtual hand of cards. Start with one Fighter card, since simple combatants are the baseline in old school D&D. Roll a D8 and draw that number of virtual class cards to match rolls on the old random NPC class collection. This makes up the hand of class cards for this group, a subset of the whole class collection, biased towards fighter, and possibly biased towards another class or classes. For each NPC, the class is a random draw from the hand of classes. So now it is more likely to make groups that are a wizard and guards or some clerics, a bard, and guards, and similar groups with more than one of the same class, rather than all looking like balanced random PC parties. With the new theme tag system in place for details, I spent a couple hours this morning adding to the details list, so there are more to choose from when a theme or two is selected. I'm also experimenting with doubling up on details. Currently one room in six has a detail, and now one in three with a detail gets a second one. I may have to do some sort of weighting system though, so when I add variations, like more kinds of books or corpses, they don't imbalance the table too much in favor of books or corpses. In the past month I have put in a lot of time on DunGen, DunMap, and Hiring Hall. Hiring Hall got extended to have an option to do hirelings for Astonishing Swordsmen and Sorcerers of Hyperborea. Though it needs another pass to round out the occasional classed NPCs, particularly bringing up their abilities to the minima for their classes. DunGen and DunMap got a major lift in the handling of notes, with separate editable fields for things that were all being lumped in the notes field. This is the first step in a UI rebuild that should make it a lot better for the case of saving, editing, and running dungeons. DunMap got an important bug fix to allow it to load the map images of imported dungeons, so it can properly work like DunGen and allow at least some movement from one computer to another. This is also a first step towards allowing some sort of remote save, maybe by storing your dungeons in your Google Drive or Dropbox, so you can access them from other devices, without making them dependent on a server run by me. Today I finally finished a long planned feature to extend the theme to the little descriptive details for things found in rooms. Now these are tagged like room types, so if you choose the fort and palace theme, you won't get the weird, horrible stuff tagged with the creepy theme. I'll start adding more again, now that I have them all tagged. Then I did a few passes at squashing bugs that had snuck in while I was making the UI and content changes mentioned above. Maybe fixed half the outstanding bugs? This morning I woke early (been doing too much of that lately) and mulled over the idea of running a campaign using Barbarians of Lemuria set in the Erikson and Esslemont's Malazan world. It's a lighter set of mechanics than GURPS that they originally used, better suited to the amount of time and energy that I could invest in campaign creation. The magic system would have to be morphed to fit the world, or replaced. The boons, and flaws would have to be adapted, and a suitable set of regional backgrounds worked up, but the fit would be pretty good. The rate of character advancement would not care about the Conanesque treasure wastage at the end of a session, and be more about "How deep did the character have to dig to survive?". If I actually go with it, I'll post more here. I am working on houserules for my Astonishing Swordsmen and Sorcerors of Hyperborea campaign this morning. The main topic of the moment is variation from straight old school Vancian magic. Back in my 80s OD&D campaign I addressed making magic less predictable and a bit more epic, by including a D20 roll at every spell cast to get a spell off, with fumble and crit effects, spell level, caster level, and casting attribute bonuses involved, and allowed overcasting beyond spell slots at a penalty to the roll and taking HP damage based on the level of the spell and how the roll went. So casting was pretty reliable until spell slots were used up, then less so, and costing damage to self to overstrain. It worked pretty well, but was not really high on story flavor. The primary concept is that magic is chimerical and capricious. A sorceror can manage the inherent riskiness of magic by preparation and not overtaxing himself. Vancian "finals cramming, with memory wipeout" style has always seemed odd to me, especially with multiple copies of the same spell being memorized into slots. So I will use each spell slot two ways. It is a spell that the sorceror has prepared enough that day to be as safe as possible and a packet in a sorcerous energy buffer to allow spells to be cast without undue strain. So a caster has two first and one second level slots can have two first and one second level spells prepared, and could cast either first level spell with each first level slot and either one or the prepared second level spell with the second level slot. That's all pretty straightforward and pretty similar to a 3rd Ed or 5th Ed sorcerer. Various circumstances will add STRESS to a spell casting, and with Stress things are more likely to go wrong and in unpredictable ways. Stress will be a sort of currency, casting a spell with more Stress will likely make it go more spectacularly wrong. Casting with even one level of Stress should be dangerous. More should be really scary. Casting a spell over your level is a deeply desperate measure. This mechanic might replace various printed mechanics relating to armor, scrolls, interruption by damage, etc. Each point of Stress will cause one roll on the table below. For each result, I plan to offer the choice of the rolled result and the next one farther down in the list. Followup rolls will be AFTER the choice. Each point after the first will modify all rolls by +5. Dungeon Crawl Classics has some nice tables in the right direction, so some of these results refer to those tables, which might take some results reinterpretation to fit in. 36-40 Wipe out preparation of one spell (the attempted one first, if prepared). 41-45 Wipe out energy of one spell slot(the attempted one first, if slot was used, else highest available). 110+ Attract the (potentially ongoing) attention of an inimical divine being. In this campaign that might mean Cthulhu awakens, and starts disturbing the caster's dreams, sending minions, and eventually showing up itself. So, Bilzor the Magician, at first level, has cast his one prepared sleep spell for the day, and his party is being overrun by bandits. He tries to save the day by casting another sleep spell, but his only spell slot is drained. He rolls a 47 and has the choice of loss of a minor magic item or attracting the attention of a nearby magically sensitive creature. He picks the item, and since he has a Potion of healing and a level 1 spell scroll, the GM dices and the potion bottle shatters. Had he picked the attention, he gets a creepy being watched feeling, and the DM consults his notes and decides the Ixian witch a level deeper in the dungeon feels the emanations of the reckless spell, and gets a glimspe of Bilzor in her mind's eye, and a general sense of where he is, and might come hunting for him or is at least alerted, can make preparations, like dispatching a minion to spy, and is not surprised by the party for the next day. Later in the fight, the party's fighter goes down, Bilzor is beset by a pair of bandits, casts a further sleep spell, and is struck by one of them before he gets it off. This time, he'll have 3 Stress, for overcasting beyond his slots, melee, and being injured while casting, and will be adding 10 to each of three rolls. With a 16 first roll that would have succeeded without backfire in the first instance, he now has a 26 result, and the sleep spell fizzles or he has additional Stress for any further casts until he can rest for the day. He chooses the Stress so his spell might go off. The second stress roll of 77 becomes 87 and he declines the permanence of DCC major corruption and takes a 3 point hit to his CHA after followup rolls, the DM decides these points will recover at one per week. The third roll of 52 becomes 62 and he is stunned for a round, declining the DCC misfire table. Bilzor might survive to recover that CHA if the spell puts all his enemies to sleep. I'll probably tweak this some more, but it gets pretty close to what I want in letting low level casters not be one trick ponies, but with significant risks, and letting higher level casters get themselves into deep trouble when they attempt great feats of magic. I got the second edition book for Astonishing Swordsmen and Sorcerers of Hyperborea a couple weeks ago via the Kickstarter. I've had the first edition boxed set for a few years, but never got around to actually running it. This time I intend to give it a whirl. "So I'm thinking about setting up to try running AS&SH on Roll20. Potential interest? No time picked yet, but I'd aim to have a starter scenario ready in about a week and do the schedule matching dance along the way. In person is also possible if SF Bay Area people are interested." Given the positive initial response, I got started today on a scenario. There's now enough that I could run it in a pinch, and time to polish it a bit. Now I have to fit it onto the campaign map and flesh it out some. What is this Astonishing Swordsmen and Sorcerors of Hyberborea Game? Imagine D&D was written without the influence of Tolkien, but heavily influenced by Weird Tales authors like Robert E. Howard and Howard Lovecraft. The setting is a pocket dimension overlaying the uttermost North, inhabited by groups descended from historical and not quite historical peoples of the Earth, Vikings who were swept off by a storm, Cthulhu cultists that crossed over in a ritual that went sideways, and the like. The rules have a lot of AD&D flavor, but PCs are assorted humans or nearly human, and not elves or dwarfs or halflings and the monsters have a similar filtering. We'll go with method II for PC attributes. Then do it two more times and pick the set you like best out of the three sets. Then you can trade points by paying down two in one attribute to bump another up one. The range is bounded 3-18, no boosting to 19, and no percentiles on 18 for fighters. The ranges on the attributes for bonuses and penalties is 3, 4-6, 7-8, 9-12, 13-14, 15-16, 17, 18. The bonuses are flatter than late editions of D&D, with an 18 giving +2 to melee attacks and +3 to damage, for instance. Hit Dice for classes are pretty much what you would expect, D10s for Fighters, D4s for Magicians, D6s for Thieves, D8s for Clerics. Subclasses of each of the main four may redefine that up or down. House Rule: Take the best of three rolls at first level, and best of two rolls at each level thereafter. There is a standard starting gear pack for each class and subclass. We'll go with those, or you can swap to similarly valued weapons and other gear that makes sense for your character. This is a game with class and subclass specific EXPs for levelling, like older flavors of D&D. The level table goes up to level 12, it is unlikely the campaign will last to get close to that cap. Subclasses have two Prime Requisites and both have to be 16+ for the bonus. Barbarian STR 13, DEX 13, Con 13, D12 HD, a lot of wilderness and adventure related skills and abilities, No Rage. Great saves, Think Conan. Amazon Women warriors are legendary; their men, not so much. Hyperboreans are the tall, thin, pale, longlived indigenes, who consider all the Earth exile descendents beneath them, as snooty as other games' high elves without the pointy ears and infravision. So roll up a character's attributes and choose a class it suits if you are interested in joining in.